The RIAA is a bit strange in how they do Gold and Platinum certifications. They don't have a their own measurement system so they depend on record companies submitting proofs of sale and streams. That's why, on occasion, an artist might receive a batch of awards at the same time, but today's 43 new certifications for Eminem may be a record. All 43 of the new awards are for tracks from throughout his career led by "Love the Way You Lie" (Featuring Rihanna) which is now twelve-times platinum indicating over 12 million in sales/streaming. 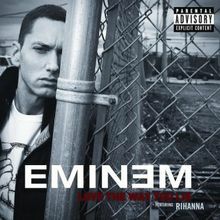 "Lose Yourself" is ten-times platinum and "The Monster" is six-times. There have also been a few other veteran artists who have received awards over the last quarter including two major increases in albums both already certified Diamond (ten-million units). The Bodyguard soundtrack is no eighteen-times certified Platinum while the Saturday Night Fever soundtrack moves up to sixteen-times Platinum.